The environmentally-friendly department colour A3 business MFP reliably prints high-quality documents ar very fast 75ipm speeds. 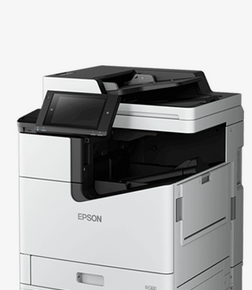 The WorkForce Enterprise series uses up to 88% less energy compared to lasers1. With low waste supplies and a simple working mechanism the WorkForce Enterprise reduces the environmental impact of print by providing a low power solution with fewer supplies required. Enjoy a high paper capacity of 5,350 sheets, and print up to 100k black or 50k colour pages without replenishing ink2. To Find out more about the Enterprise range or any lease printer option, please contact us on 044 9672855 or fill this this form.